I do a best of feature on this site and have attempted to make a single disc greatest hits-type compilation for the Drive-By Truckers and it is extremely difficult. The news recently came down the pipe that Ugly Buildings, Whores and Politicians(Greatest Hits 1998-2009) was going to get released. The album is not out but I feel I can review this solely based on the tracklisting, I have all of the songs so this is mainly a review of the song selection put out by New West, their old label that will release the album. “A World of Hurt” should not be on this disc. That is one the bands best 16 tracks; it might not make my top 50. Other than that, every other song is justifiable. Jason Isbell gets 2 songs, a fair shake for his time with the band. “Outfit” and “Never Gonna Change” are both great but the exclusion of “Decoration Day” is a little painful for me; I’m justifying it by saying the song was too long. Mike Cooley gets 6 tracks, another fair share, Patterson Hood controls the other 8. Cooley is the secret weapon of the band and gets his anthem “Marry Me” included. 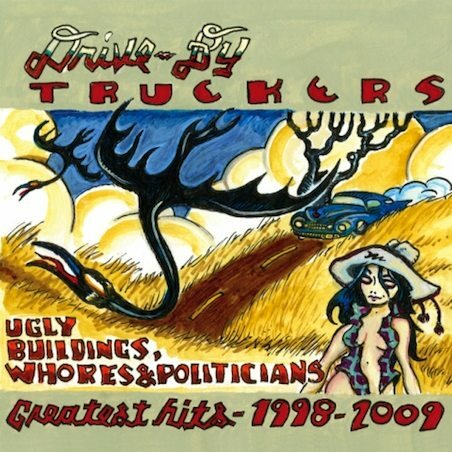 This entry was posted in 250 word album reviews, The Best of... and tagged Best of, Drive-By Truckers, Jason Isbell, Mike Cooley, Patterson Hood, Ugly Building, Whores and Politicians. Bookmark the permalink.